With a bus sector in crisis, we are urging the Government to give local transport authorities greater powers over the sector. Illegal and toxic levels of air pollution persist in many parts of Scotland, primarily due to the huge volume of cars on our roads. A single bus can take 75 cars off the road so if more people choose buses we can cut pollution from traffic. Buses successfully operated in the public interest would enable profits to be reinvested into newer vehicles which would further cut pollution. Over 1 million people in Scotland live in transport poverty, defined as “when people don’t have access to essential services or work because of a lack of affordable transport options.” Buses provide a vital lifeline for the 30% of Scottish households who do not have a car. This figure is worse in more deprived areas with half of Glaswegians not having access to car. This lack of public or private transport means they may struggle to get to work, to socialise or to access public services. The Scottish Government must act to challenge this injustice and help provide affordable public transport to help people participate fully in society. In other instances, the cuts in bus routes and lack of alternatives have led to people being forced into owning a car to get to work. Forced car ownership can make it harder for people in low incomes to break the cycle of poverty. Bus companies have cut nearly a fifth of routes in the past ten years . Whilst these routes may be unprofitable on a business balance sheet – they are often vital links for communities. Proper public oversight of these decisions could mean that the benefits of routes to communities would be better weighed up against the cost of operating a service. Right now all too frequently companies scrap unprofitable routes and just rack up the revenue from the busy routes. Climate emissions from transport have barely fallen in 20 years. Transport accounts for 27% of all Scotland emissions – the majority of which comes from cars. If councils are supported to successfully run bus companies, we can improve services and get loads of cars off the road. If we want to drive emissions down to zero in the coming decades, we need Government to take action to foster a significant increase in use of public transport. Buses are a public service. 31% of us in Scotland use the bus at least once a week, with higher figures for younger and more deprived people. Right now we have no way of influencing the quality of that service. Free market ideology of healthy competition has not borne out, meaning we often have no alternative but to shut up and take it. Giving local authorities power over buses would enable some democratic oversight in the running of this public service. People seeking election to Council could pledge to improve or alter services and people would have a way to raise their concerns. In the past 10 years bus fares have risen by almost 50%. Under highly regulated franchise schemes or publicly run models, fares could be capped. Transport for London, which operates a franchise model, caps daily bus fares at £4.40. 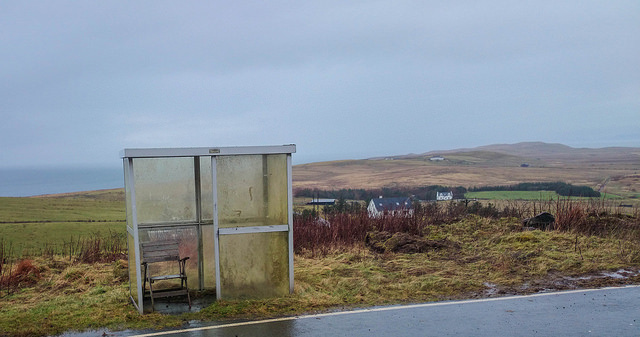 Citizen’s Advice Scotland published a shocking report in 2016 which highlighted the difficulty rural people face accessing essential services such as healthcare, supermarkets and work when reliant on the bus. Examples included jobseekers in Nairn who have to pay 15% of their weekly income for one return trip to the jobcentre; 38% of locations surveyed had no Sunday service that connected them with local hospital; Students in Dumfries and Galloway did not have services that got them to connections or Glasgow in time for the start of their classes. Edinburgh’s bus company was one of the few not sold off during the wave of privatisations in the 1980s. It is still run by Edinburgh Council and it is a real success story. Passenger numbers are healthy and they’ve invested heavily in lovely, new modern buses including 100% electric buses. They won awards again last month and we think they are a model for success. Whilst public control might not immediately solve all the problems of Scotland’s bus services overnight, it is a much superior model in which to push for and deliver the changes necessary to create a world-class bus network. That’s why we think you should take action to tell the Scottish Government to give Councils more controls over the buses, so they operate as a public service rather than just for private profit. This consultation closes on Tuesday 5th December. With huge thanks to Sustrans, Citizens Advice Scotland, and Transport Scotland for their research and reports in this area.